Wrong Italian Baby Names - These Names Are NOT Italian! There are a lot of websites regarding baby names and they always have an Italian baby names list: but very often quite a few of those names are NOT Italian names! For example, almost 70% of "supposed" Italian names on www.babynology.com is incorrect, very unusual or just wrongly spelled! Here you can find a list of wrong Italian names, baby names that seem Italian but they are not actually used in Italy (we are Italian, we know it!). Agosto This is just the Italian word for the month of "august"
Berengar Never heard as a name, it's not even an Italian word! Ehno Never heard as a name, it's not even an Italian word! Faramundo Never heard as a name, it's not even an Italian word! Fonsie Never heard as a name, it's not even an Italian word! Galeotto It means "convict" in Italian and of course it's not used as a name! Lothario Never heard as a name, it's not even an Italian word! Poldi Never heard as a name, it's not even an Italian word! Trilby Never heard as a name, it's not even an Italian word! Zanebono Never heard as a name, it's not even an Italian word! 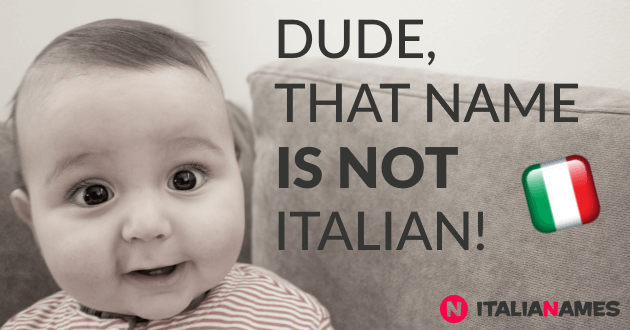 Don't use wrong spelled Italian baby names!